I was cleaning up my Knitting room and I came across this cute little pattern. It can be made on any machine and with whatever yarn you want. Of course, different yarns will give different sizes. This pattern was in a hand out from a passap yarn store that used to be here in Cleveland. There is no author or copyright so I am going to share it. A hand knitter could also knit this. How cute this would be to make and wear to a hand or machine knitting seminar. The pattern states to use a 2/15 yarn. You cast on 10 stitches on every other needle. I used a e-wrap . You will knit 20 rows at tension 3. 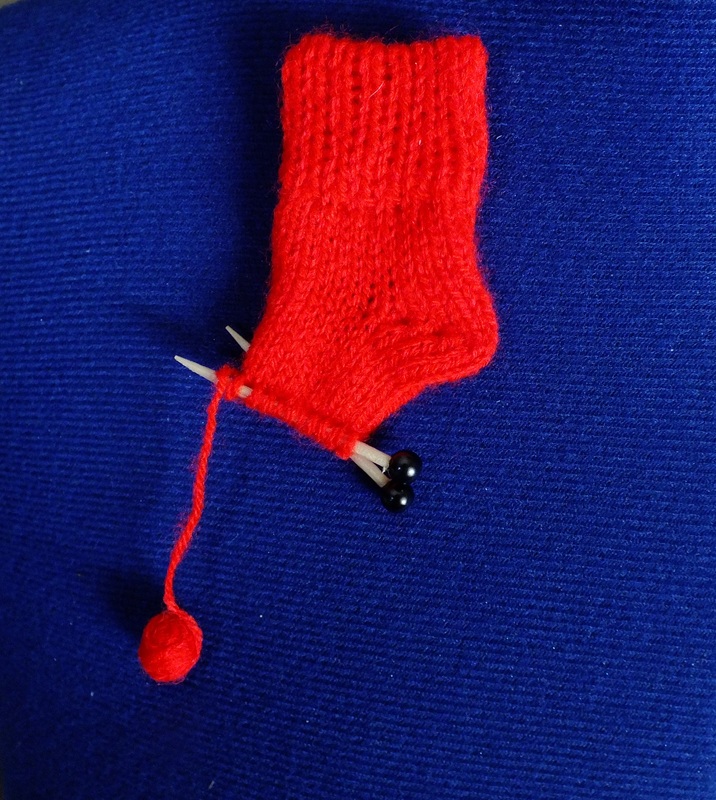 Now hang the hem on the empty needles. Change tension to 5 (20 stitches-may have to increase one stitch) and knit 8 rows . Carriage now on the right. Pull to hold the left 10 needles. Set machine to hold and short row down to 3 stitches on the needles in work (pull one stitch to hold on the carriage side each row)Now short row back out(put one needle back into work opposite the carriage) until all needles back in work. Knit 10 rows of stockinette stitch. Now take off middle ten stitches on one toothpick and five from each side will go on the other toothpick. Leave a tail the length of a yard to wind into a ball. May have to use glue on the last wrap of yarn around ball. Don’t bother buying one of those pin backings. I have them and it sticks out too far. Just use a big safety pin. I also tried one doing a 1×1 rib and it does not look good. You need the thickness of the folded cuff to hide the pin. My sock or unfinished sock I should say is about 2 to 2 and a half inches long. I also tried making one with variegated sock yarn and it looked weird because the colors don’t change for a long time.